Clean Jacksonville to be used by bunker supplier JAX LNG to perform deliveries. The Clean Jacksonville will be performing regular LNG bunker deliveries to the world's first LNG dual-fuel container ships, the Isla Bella and Perla del Caribe, operated by TOTE Maritime Puerto Rico between Jacksonville and San Juan. Image credit: Conrad Industries, Inc. 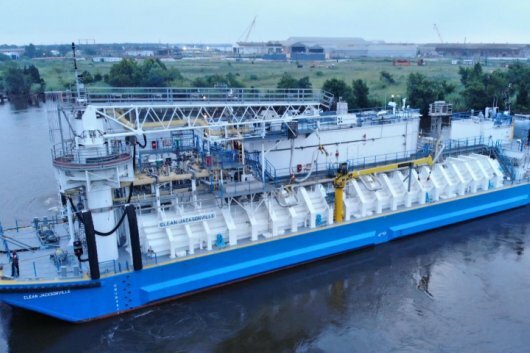 The first LNG bunker barge to be built in North America, the Clean Jacksonville, has been completed and delivered, shipbuilder Conrad Industries, Inc. reports. The landmark vessel was constructed at Conrad Orange Shipyard in Orange, Texas, with gas trials performed at Port Fourchon, Louisiana. The barge is due to supply LNG to the world's first LNG dual-fuel container ships, the Isla Bella and Perla del Caribe, operated by TOTE Maritime Puerto Rico between Jacksonville and San Juan, Puerto Rico. As previously reported, bunker supplier JAX LNG, LLC - a joint venture formed by Pivotal LNG (a wholly-owned subsidiary of Southern Company Gas) and NorthStar Midstream, LLC (a joint venture of Oaktree Capital and Clean Marine Energy) - is the long-term supplier of LNG to the two ships, whilst Clean Marine Energy will be handling the bunker barge's commercial management. JAX LNG has already been given the go-ahead by the US Coast Guard (USCG) for the operation of its waterfront LNG facility in Jacksonville and the approval to supply TOTE Maritime's two LNG-powered boxships using the Clean Jacksonville as its supply vessel. JAX LNG's state-of-the-art, small-scale liquefaction facility and marine loading jetty is located at Dames Point, on the St. Johns River, near the port of Jacksonville. It is said to be North America's first small-scale waterfront LNG facility and features on-road and marine-loading capabilities. The facility's initial liquefaction capacity is 120,000 gallons of LNG per day with two million gallons of storage capacity in one huge cryogenic storage tank constructed by Matrix Service Company. Prior to the launch of the Clean Jacksonville, JAX LNG has been delivering LNG to the TOTE vessels via truck, sourcing product from its network of LNG plants in the Southeast United States, including fuel delivered by Pivotal LNG from Macon, Georgia. Highlighting the various project milestones reached with the completion of the Clean Jacksonville, Johnny Conrad, president and CEO of Conrad Industries, Inc, said: "It is the first LNG bunker barge built in North America. It is the first time the GTT membrane system has been installed in a non-self-propelled barge in the U.S. It is the first time an LNG bunker mast of this type has been built. The list goes on." Discussing the collaboration with regulatory agencies for the construction of the Clean Jacksonville, Brett Wolbrink, vice president of Conrad LNG, LLC, remarked: "We were fortunate to have such a good working relationship with the USCG and ABS throughout the design, engineering and construction of the LNG bunker barge." Commenting on GTT's role in the process, chairman and CEO Philippe Berterottiere, noted: "The broad collaboration between TOTE, Conrad, the myriad project stakeholders, and U.S. regulators led to the successful design, construction, and commissioning of this unique and ground-breaking project. Beyond our traditional role of designing the cargo containment and other cryogenic elements, such as the innovative REACH4 bunker mast, GTT adapted and expanded its support services to ensure the effective training of the barge crew and the safe and satisfactory execution of the barge commissioning activities and gas trials."